Just want to say, she looks wonderful and healthy - you have done an awesome job with her! I'm happy you kept Mocha too. Keeping her successfully as you're doing is a great introduction to reptiles. She looks awesome - and very happy! So happy for you both! You've done a great job! Mocha "looks" bigger now, Birby! I'm not sure. Please post an August pic and a current pic side-by-side so we can see how she's grown. I'm not experienced in uploading videos. Have you uploaded your video to some free site like Imgur, YouTube, or maybe Photobucket first? That will give you a URL to insert into the ladder icon 15 icons in from the left in the line up above. Here are some instructions that may help. To insert a video find 3 lines of choices at the top where you make a post. On the second line, 15 icons in from the left, you'll see the video icon. It looks like a ladder. Click this video icon & paste your video URL right there. Your video and arrow like you may have noticed here will be displayed, not just a link. To insert a photo use the "image" icon next to the "ladder" icon. First upload your images or video to a free Imgur or YouTube account. 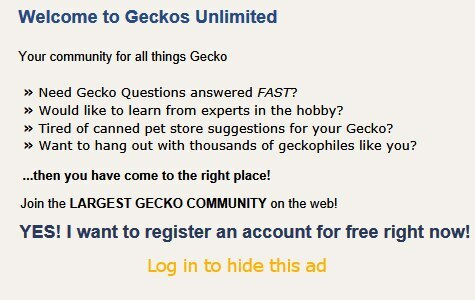 Then use that jpeg or URL to upload your image or video onto Geckos Unlimited. Click "insert image url" OR "insert video url"
Imgur, YouTube, and maybe PhotoBucket (again) now offer free online sites for sharing photos and maybe videos. In the first screenshot you'll see Hilde's red arrow pointing to the photo icon. The ladder icon is the next icon to the right. Use that. Last edited by Elizabeth Freer; 01-31-2019 at 11:04 PM. Photobucket does not allow sharing anymore. That's what I thought. Then I saw PhotoBucket pics on GU that seemed to show up once again when, for a while, those same PhotoBucket photos had disappeared. Maybe those keepers are now paying for access. I don't know. Last edited by Elizabeth Freer; 02-13-2019 at 02:00 AM. Look at that little Mocha!! So cool! !